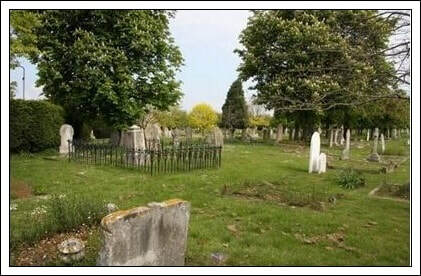 On Monday, November 4th, there was laid to rest in Whitstable cemetery Private H. E. Hagger, the elder son of one of Whitstable's most respected inhabitants, Mr. George Hagger, of Culvers, Borstal Hill. 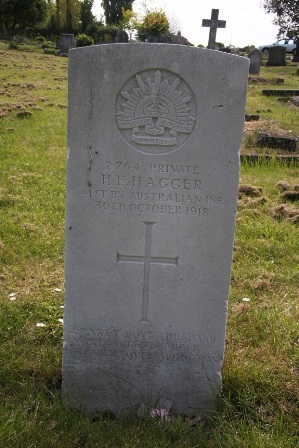 The story of Private Hagger was that of many a gallant man who has laid down his life that we might be free and the military honours paid to him at the last were but the small public recognition of the passing of a brave soul. When the war broke out Private Hagger, who had been some 16 years in Australia, was prospecting for water in the "Back-blocks" of Queensland, hundreds of miles from civilisation. But even there the news of the great world-conflict traveled. The call of Britain to her sons resounded even to those uttermost corners. Private Hagger left all his machinery and came home to take his share in the imperial battle for freedom and right. The whole of his active service was in France and it was during the later months that he was recommended for the D.C.M. for one of those acts which will be told as sagas to our children long after the more passing incidents of the world's great war have been forgotten. On the night of the first of September he and four companions went out scouting, attacked and captured a German trench taking 38 prisoners. This, however, was not enough for the gallant quartet. Private Hagger and two others went on in search of a machine gun which had opened fire. One of the three was killed and the other man seriously wounded. Private Hagger continued alone, got the machine-gunner (who was "camouflaged" as a shock of wheat) but just at that moment was shot in the arm. He lay in the open for 14 hours when he was rescued by a stretcher party and was carried to the "dangerously wounded" ward. There he lay for some weeks, but gradually recovered and came home for leave. While at home he caught the prevailing epidemic, was removed to the military hospital at Herne Bay, and although every effort was made to save his life, the illness, following upon his wounds, proved fatal on the 29th ult. So passed away one who was loved as a man and honoured as a hero. His funeral was attended by a firing party of the Cheshires, whose buglers sounded the "Last Post" as the body was laid to its last long rest. Many friends attended, amongst them being Messrs. A. W. Daniels, George Kirkby. H. K. Daniels. G. H. Goldfinch, David Daniels, R. Fowler Mackenzie, G. Willis Jones, L. J. Skidmore, and a number of wounded soldiers. Private Hagger leaves a wife and two children who are at present in New Zealand. His only brother, Major C. Hagger. M.C., has been for the last three years with the Salonika force and, fortunately now there is longer cause for anxiety regarding him to our respected fellow-townsmen and his beloved wife, to whom the sympathy of many residents and friends has poured in during the last two weeks to comfort them and sustain them during this hour of sadness and trial.